Giving back to the community every Monday. Since May of 2008, Matthew Pierone, chef and owner of Gourmet Café in Parsippany, has made it a priority to utilize his restaurant as a way to raise money for many local non-profit organizations. Prior to opening the restaurant, Matt had always been personally involved with charity donations so he wanted his business to do the same. With the belief that as a part of the community it is necessary to help give back to those in need, “Make a Difference Mondays” donates 10% of the day’s sales to a designated non-profit organization. Matt’s generosity applies to all sales for lunch, dinner, take-out, and even gift certificates purchased that day. Gourmet Café has built an incredible reputation for its award-winning cuisine and exceptional service. Matt’s talent and passion for creating delicious, high quality, and unique Italian dishes is undeniable to his customers. However the same goes for his caring heart. Any regular patron can vow to the daily welcoming and accommodating environment of the restaurant, yet on Mondays that feeling is even greater. Matt describes, ‘That is the best part. People all have their place in giving back with what they are able to do. Working here 90 hours/week, I don’t have hours to volunteer, but this is my way of helping. It’s something I am proud to be able to do. It also gives residents another way to help – just by enjoying a nice meal. – Carly Phillips “Par-Troy Life” Magazine. Every Monday 10% of our sales go directly to a designated Charity or non-profit organizations. For those involved with a non-profit organization who are interested in learning more, please call or email us. 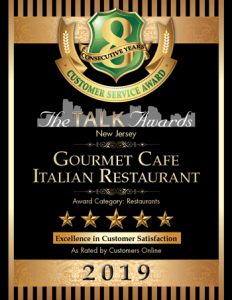 We sincerely thank all of our wonderful guests that continue to make Gourmet Café the community-service focused restaurant we strive to be!